Palm just dropped a whole lot of information on the upcoming webOS 2.0, including the release of the webOS 2.0 SDK starting today. Still no word on when webOS 2.0 will land on our devices or a mythical new device, but this is a great first step and there is plenty to get excited about. 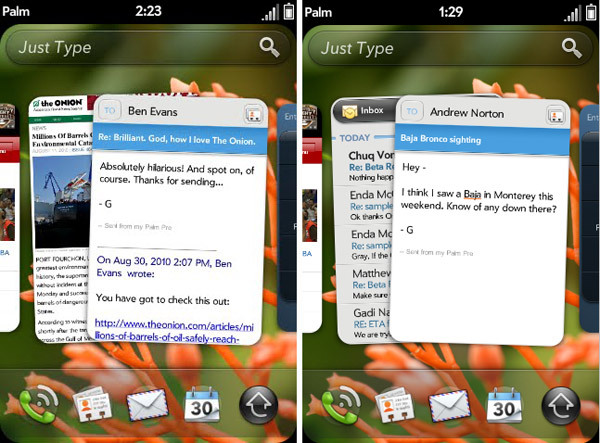 Palm briefed the gents at Engadget and here’s our take on the updated features. Stacks: An extension of the cards metaphor, stacks allows you to group related cards. Have a bunch of cards displaying webpages, they will be neatly organized into a stack. They’ve taken one of the best features of webOS and improved upon it. Bravo! Just Type: Universal search is now given a new name, “Just Type”, along with some new tricks. They have opened up the API to developers, so now “Just Type” search is accessible by third party apps. Quick Actions: This is a developer feature, but one that will have long reaching effects on end users. Developers can utilize quick actions to perform a string of events. Palm explains that with Quick Actions, ” you will be able to start an email, create a message, update your status, search your favorite websites-all without having to launch an app.” Sounds like AppleScript, but on a mobile phone. Extremely powerful and it’ll be interesting to see how devs incorporate this into webOS. Synergy Improvements: Developers now have access to Synergy, so they can leverage the “contact joining” that was previously available to apps like Facebook. HTML 5 Enhancements: Improved support for HTML 5, including image data and gradient use with Canvas, the availability of local and session storage, geolocations support and application cache functions. PDK plugins: The PDK plugin will be out of beta and now fully integrated into the SDK. Palm explains this will allow developers the ability mix PDK elements with Mojo development. Stacks and Just Type are of course the most notable features since most end users can easily relate to front end features. The other improvements, while geared towards developers, should improve the developer experience.